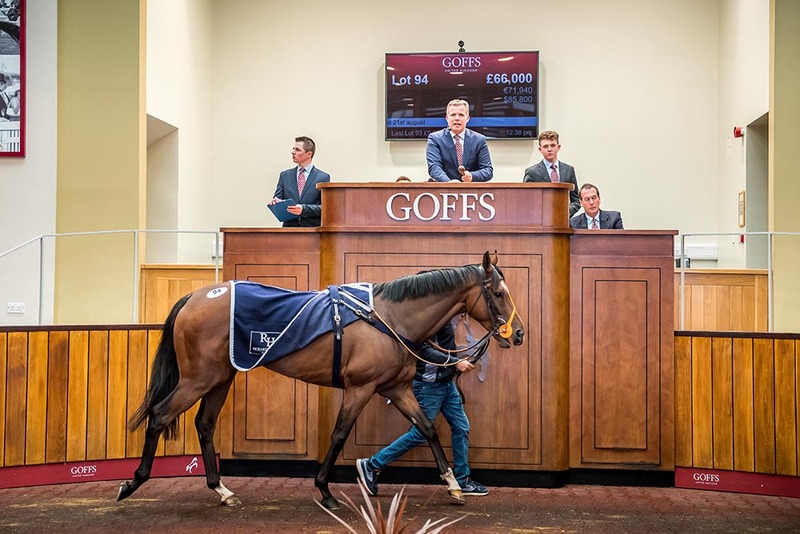 A large crowd of domestic and international buyers from around the world created a vibrant market at today’s Goffs UK September HIT Sale at Doncaster with all the sale’s indicators showing healthly growth. Headed by two big drafts from Gigginstown House Stud whose 26 horses represented their annual dispersal and Godolphin who offered 18 horses, demand in the ring was strong from the first lot and held throughout the day with the clearance rate finishing at 85% and the median and average up 45% and 29% respectively. Headlining today’s sale was Middleham Park Racing’s Pete So High (Lot 94) who came into the sale with winning form having won his last two starts, and saw Aidan O'Ryan and Gordon Elliott go to £66,000 to secure the 3YO with Hamish Macauley the under bidder. Currabeg Stables’ 3YO Yug (Lot 33) also proved popular, selling to Bobby O'Ryan and Hanshen Tham for £56,000, while Gigginstown House Stud’s Grade 2 placed Marinero (Lot 159) also featured in the top lots when selling to David Christie for £54,000. “We were well supported with some big drafts from the likes of Gigginstown House Stud, Godolphin, Middleham Park Racing etc. and as such we attracted a large buying bench from throughout Europe, the Middle East and Australasia which translated into a solid day in the ring. The clearance rate of 85% demonstrated the healthy demand for horses today and it’s pleasing to see growth in the sale’s statistics with the average and median both showing significant increases on last year.